I have been sent the Skinn Hydrate and Wow Eye Duo (Hydra Vital Eye Cream and Wow Factor Mascara) and the Skinn Forget Me Not Perfecting and Correcting Palette with Brush. I’ll happily try something totally new. 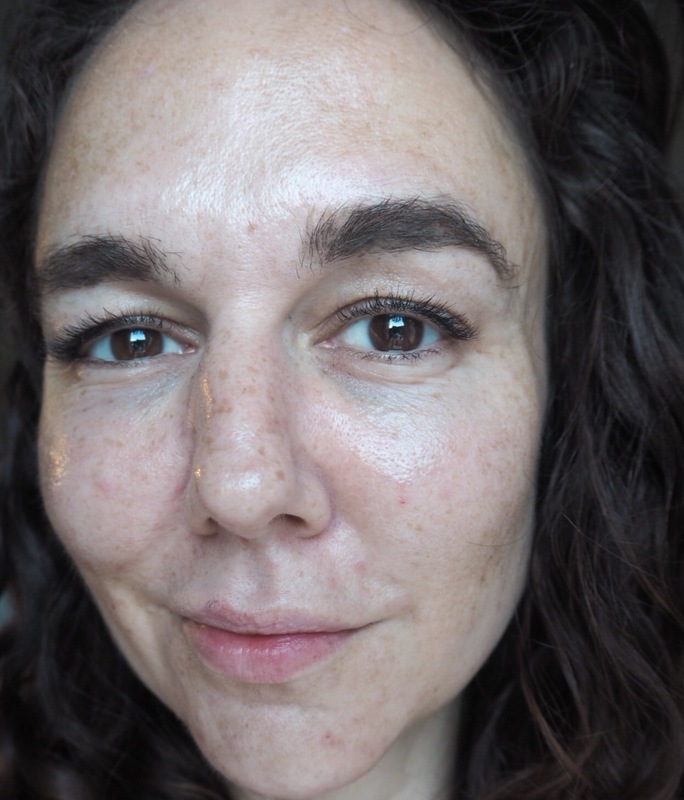 I have no experience with Skinn, but I like the ethos behind the company so I was looking forward to trying out some of their products. Ingredients- Aloe Barbadensis Leaf Juice, Propylene Glycol Dicaprylate/Dicaprate, Caprylyl Methicone, Isosorbide Dicaprylate, Butylene Glycol, Glyceryl Stearate, Peg-100 Stearate, Euphrasia Officinalis (Eyebright) Extract, Ascophyllum Nodosum Extract, Asparagopsis Armata Extract, Chrysanthellum Indicum Extract, Myrothamnus Flabellifolia (Resurrection Plant) Extract, Helianthus Annuus (Sunflower) Seed Oil, Rosmarinus Officinalis (Rosemary) Leaf Extract, Ascorbic Acid, Sodium Hyaluronate, Glycerin, Citrullus Lanatus (Watermelon) Fruit Extract, Pyrus Malus (Apple) Fruit Extract, Lens Esculenta (Lentil) Fruit Extract, Iris Florentina Root Extract, Sodium Pca, Sodium Lactate, Cananga Odorata (Ylang-Ylang) Flower Oil, Opuntia Ficus-Indica (Prickly Pear Oil) Seed Oil, Coconut Alkanes, Coco-Caprylate/Caprate, Aqua, Polyacrylamide, C13-14 Isoparaffin, Laureth-7, Polyglyceryl-2 Stearate, Stearyl Alcohol, Citric Acid, Sodium Acrylates Copolymer, Propanediol, Lecithin, Disodium Edta, Phenoxyethanol, Chlorphenesin, Caprylyl Glycol. Skinn Hydra Vital is quite a rich cream, probably richer than I prefer in an eye product. Also it comes in a jar, which isn’t the best packaging for skincare. 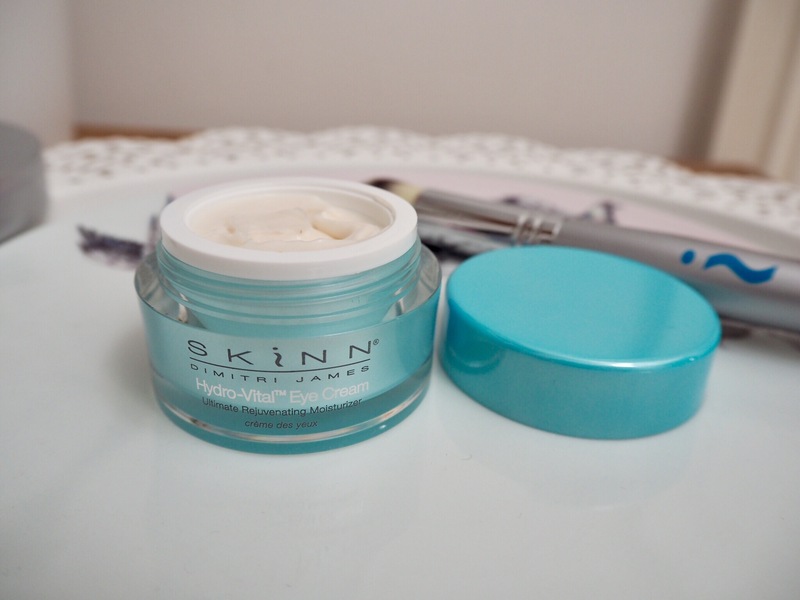 But I actually have enjoyed Skinn Hydra Vital Eye Cream, it is very soothing, moisturising and quickly absorbed. The first ingredient is Aloe Vera which is renowned for its anti inflammatory properties. It also contains eyebright, a traditional anti inflammatory, and resurrection plant. Resurrection plant is a promising anti aging additive, found in studies to improve elasticity and enhance skin radiance. It comes in a jar, but the ingredients list sounds promising and compliments where compliments are due, my under eye does seem to like Skinn Hydra Vital Eye Cream. It’s moisturising and soothing and does something for my under eye morning puffiness. 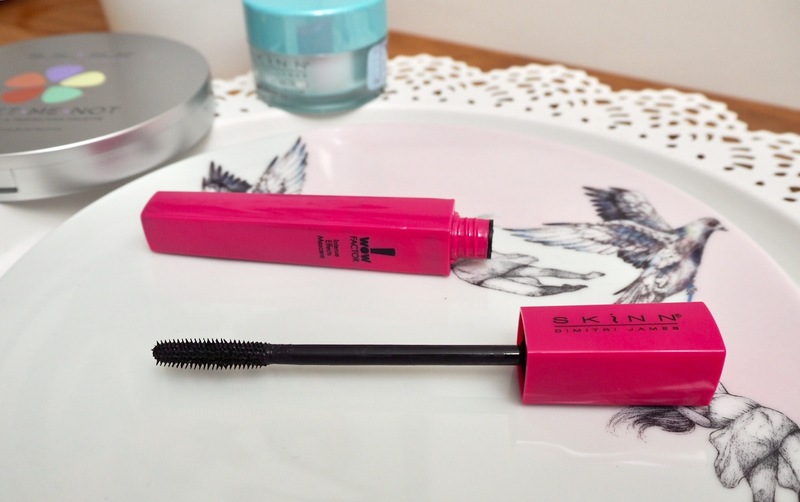 The hot pink of the Skinn Wow Factor looks frivolous, but this mascara is seriously good. It has one of those plastic brushes with little bristles. It’s certainly volumising and lengthening and, importantly, it lasts really well. This is a cracking mascara! £19.99 for Palette and blending brush. The Skinn Forget Me Not palette is a good sized circular compact with a lovely big mirror and a cute flower design and a decent amount of product. 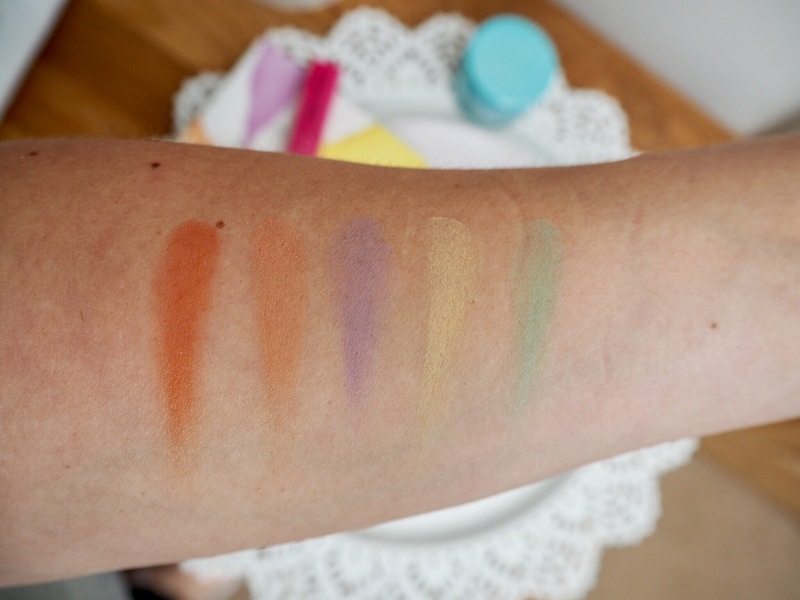 The creamy pigments are enriched with skincare ingredients. These creamy, buildable and universal pigments are infused with antioxidant Myosotis Sylvatica Flower Extract, also known as the Forget-Me-Not flower, to help smooth the look of fine lines and improve the appearance of skin suppleness. Vitamin C and Mushroom Extract help visibly brighten and tone skin for a more radiant and even looking complexion. Colour correction is an old makeup artist trick for cancelling out undesirable skin tones using the opposite tone on the colour wheel. 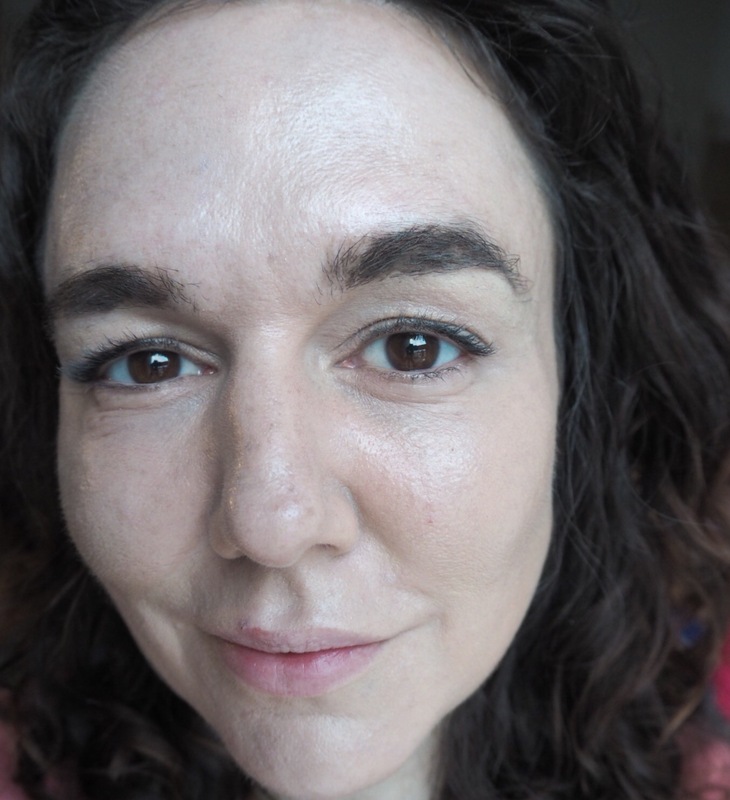 I applied the colour correction shades as suggested- peach and orange to my under eyes, green on the red blemishes, lavender on cheeks and forehead to brighten, yellow to highlight and brighten; the. 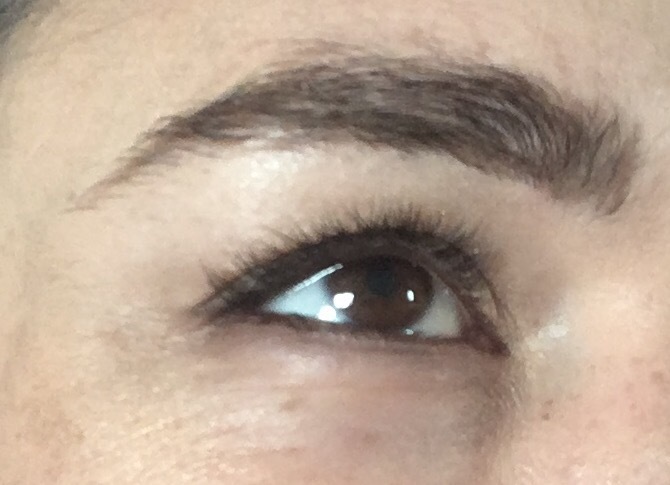 I blended my foundation (Clinique Beyond Perfecting in Alabaster) with a soft flat topped brush. 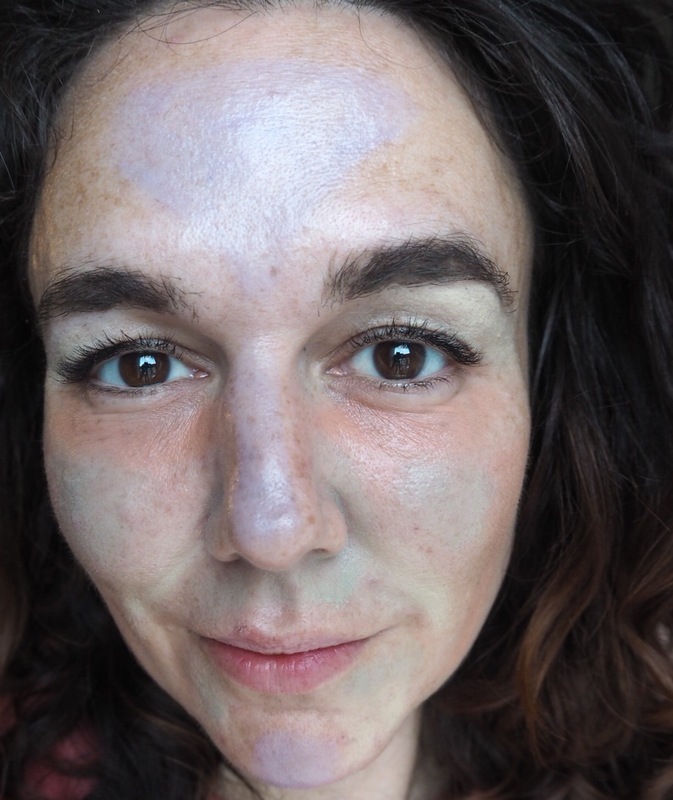 The colour corrector definitely helped conceal discolouration. My face was definitely more even toned and bright for it. The palette comes with a handy applicator brush, but you would need to clean it between shades or the colours are going to get muddy. 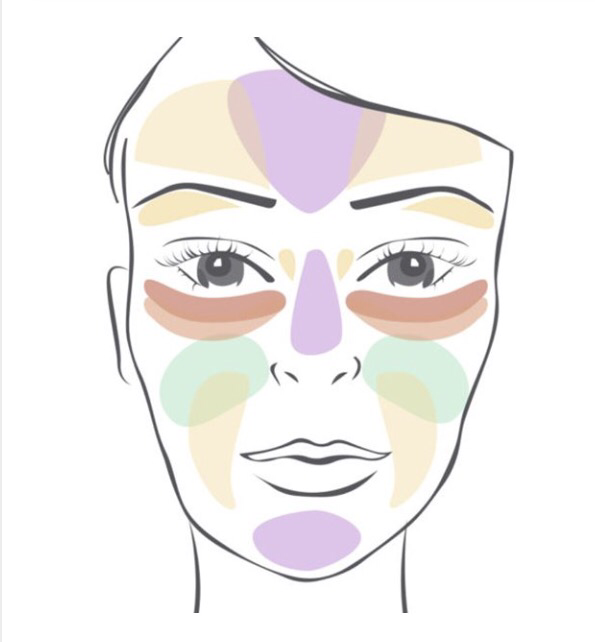 The thing with colour correction is that you must use a full coverage foundation otherwise the colours could peep through. So colour correction is best saved for days when you want a full face of makeup. I’ve been pleasantly surprised by this brand. The packaging is really cute. The Hydra Vital Eye Cream is richly soothing and ideal for dry sore eyes. 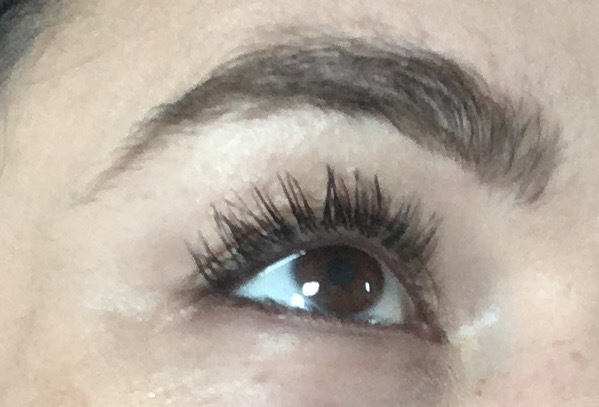 I loved the Wow Factor Mascara, it really emphasised my lashes and lasted really well. 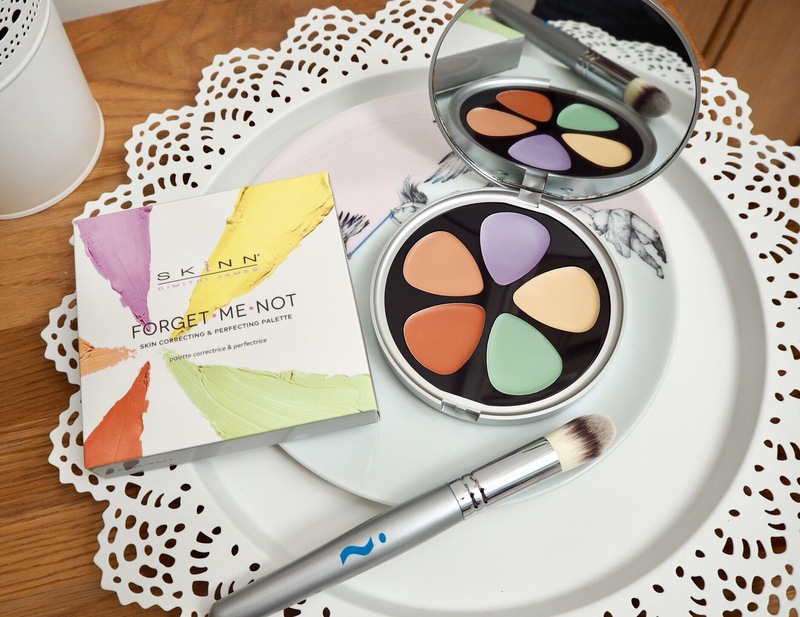 The Skinn Forget Me Not Colour Correcting Palette has a good amount of well pigmented cream and makes a great multifunctional product for concealing discolouration.